Do you know what's awesome for Internet Marketers in recent times? Ever since it's launch, Thrive Themes released a lot of products every year, and here is my Thrive Themes Review explaining how it became a crucial part for my blogging success. The USP of Thrive Themes is, they analyze problems faced by marketers and to solve it, they come up with awesome products at some unbelievable price even their competitors can't think of. Here is my first purchase with them in 2015 and finally ended up buying Membership where I'm getting access to all the existing themes and plugins also I'll be getting free access to all the future releases. The best way to save is to get an Thrive Membership account where you'll get access to all the existing products and new releases. Note: I mentioned Thrive Themes as TT in some part of this post. #1 WordPress course creation tools. A/B Test Landing pages at cheaper prices. In this post, I'll explain why I use almost all Thrive Themes and plugins for all my blogs. I was a fan of Genesis Themes before Thrive Themes released their Focus blog theme. From my knowledge, I never have seen such a conversion focused themes. Right from blogging related sites, Amazon niche sites, food blogs, SEO services to personal blogs, Focus blog theme is everywhere. You can view the demo of Focus blog here. I'm not sure whether the Pricing will be same after the launch of Visual Theme Builder since it brings complete overhaul design from the scratch. However, if you get started with Membership now, you'll get access to Visual Builder with existing price. Note: As of now, the above Themes are not available for purchase. However, If you like any design and there is an work around - get a Thrive Membership Account and you can download the theme as I can see those themes are available to download for existing customers. Even though the first set of themes are never going to be sold again, TT pushing the regular monthly updates as usual and promises to offer extend support. Most people buy an theme and further looking for WordPress plugins to place optin forms to increase email subscribers. How about your theme comes pre built with smart conversion optin placement areas. Can you name any other theme that offers options like clickable telephone numbers, countdown timers, frameless video embeds, options to hide related videos during Youtube embeds? Here the complete list of shortcodes. Every theme comes with a minimum of five pages including video landing ,optin , Thank you, and sales page. Even some of the theme comes with three homepage templates. You can see most companies offers one year free updates and charges after 12 months, but TT are somewhat different. You'll get lifetime updates with just first time charges and there is an chargeable small fee only if you need customer support after 12 months. All the themes comes with neat social share buttons as seen in left, related post widgets and much more through shortcodes. Apart from Themes, here are some of the stunning Plugins I use for every site I launched till date. Many people don't know there existed a lead gen plugin called Hybrid Connect which was later branded / replaced by Leads. I'm a hybrid connect user and later started using Leads upon its release. From the day of using the plugin , I understood Thrive Themes is going to become a massive resource for bloggers. Email Marketing is still one of the effective medium to get traffic and leads right from the stone age. If you don't know anything about Email marketing and need a spoon feed, then Thrive Leads is for you. If your getting some conversion with simple forms and planning to skyrocket your subscriber's list, then again Thrive Leads is for you. I showcase the above form in my review post where I offer something exclusive for my users and ask them to sign up. Once done, the email auto-responder will automatically deliver the files to users. Thrive Leads should be your all in one lead generation plugin and Thrive Leads is an potential OptinMonster Alternatives costs just one time fee of $67 with lifetime updates. Along with leads plugins, I started using Thrive Architect for my sites. I bet you can't find any other flexible, robust visual editor plugin in the market. There are few more similar plugins in the market, but nothing comes to what Architect does. Ever wondered What Thrive Architect do? The idea is simple.You can edit and modify whatever you need to do just from the Front End. Your creativity is your limitation; that's what I can say and check our Thrive Architect review here. Many people ask me whether Elementor is better than Thrive Architect. Honestly, I never used Elementor Pro version for my sites since I never thought of moving out of Thrive Architect. However, Thrive Themes wrote an comparison post of Thrive Themes Vs Elementor comparing everything like features, pricing, updates and support. It's one of the #1 conversion focused landing page for WordPress. I know how it hurts while using a time consuming slow loading plugins which nearly takes a day to design a perfect page. But you don't need to wait for anything when you are using Thrive. With 7-10 constant updates every month for over years, you can understand how they are taking the business seriously providing an update to customers. Ever thought of building a Buzzfeed like viral sites without the need of developers? Thrive Quiz Builder is here to save you. I'm one of the earliest people to test Thrive Headline Optimizer (THO) before its release. As I told earlier, Thrive is innovative in whatever they do, and THO is one of its examples. While there are multiple headline optimizer plugins in the market, THO is somewhat different. Most plugins optimize headings based on external traffic sources, but THO relies on internal traffic sources. I will explain why Thrive Headline Optimizer is best through this review. Think about it. If your headline is shared by someone with 100 million followers, it’s going to be massively successful, REGARDLESS of the headline. External factors make it impossible to predict headline performance accurately. In the case of THO, it displays random headlines to your site visitors and monitors the clicks based on their activities which include Click through rate, scroll depth of the post and time on content. Thus THO uses the sites internal traffic sources and thus helps you to choose the best headlines. You can check out my results below. The plugin seamlessly integrates with the default widgets option. You can use it to display custom sidebar for every URL of your site. If you're promoting the list of Best Blogging Tools, you can promote TT at sidebar of this particular URL. Currently I started using narrow width pages with no sidebar, so I don't have an live demo of in my site. 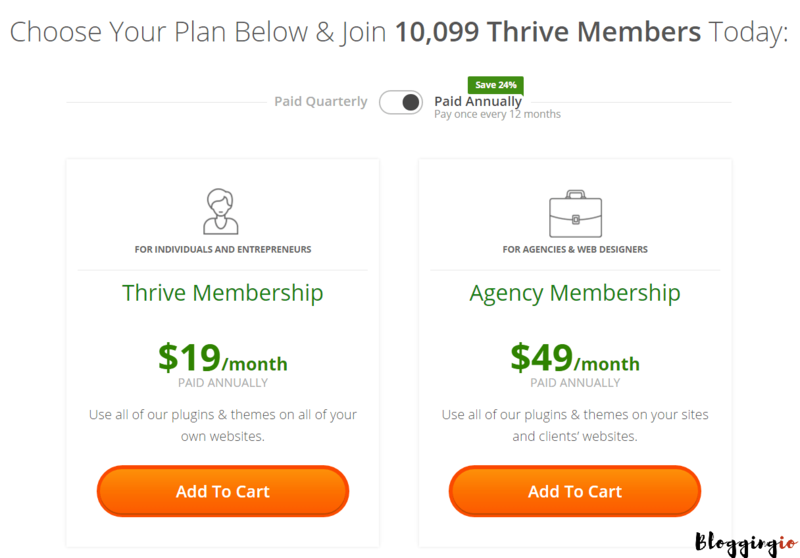 Thrive Ultimatum is the perfect scarcity marketing tool for WordPress. Increase your sales by adding countdown timers, run complex evergreen scarcity campaigns and much more. Look at the samples through Ultimatum and you can use it as widgets, banners or inside a post or anywhere on your website with the help of shortcodes. The thing is you can run N different campaigns at N different pages and posts and you can use this plugin to improve your product sales, increase affiliate income, etc. Fixed Date Campaigns - Set a start date, set an end date and then let the plugin take care of the rest. Recurring Campaigns - Automatically starts, stops & repeats campaigns for you. Time Zones Supported - Run your scarcity campaigns in any language & any time zone. 100% Translatable - Translate and run a campaign in any language. Fully Mobile Friendly - 100% mobile responsive. Auto-End Campaign - Automatically stop showing a campaign to every customer who made a purchase. Thrive Comments makes your comments section more interesting, thanks to reddit like upvote, downvote buttons paves way for healthy discussion among commentators. Apart from it, you can enable rewards for top commentators, redirect users to affiliate offers or redirect to landing page and much more things to do once they add their comments. You can check the usage of this plugin below this blogs post. You can get this plugin for just $39 with lifetime updates. If you ask me for the Review, I'm wholly satisfied with their products and never going to cancel my Membership account with them. The support is available for 24x7, however there might be some delay in replies based on the timezone. You can also look at the support forums where you'll find solutions for most common problems. All you need to raise a ticket with the issue, you can include your site login details, it will help them to solve the quickly. The best thing about pricing, you can buy single site license or 5 site license or go for an Membership account to use at most number of sites just for $19/month. Most of the products costs around $67 per year (Industry's lowest price) for a single site license and the price gradually increases for multiple and unlimited site licenses. The best part, you can save up to 24% if you choose the yearly package on membership plans. I hope you enjoyed our Thrive Themes Review where I covered almost all products with screenshots, being a customer I made it with ease. There are hundreds of companies launching page builder and more WordPress Plugins but when it comes to conversion focused design, Thrive Themes have no competition. And there comes another big hit WordPress plugin from Thrive Themes today – Thrive Ovation! They always rock it releasing the best plugins for the goal they target! I too have been a long time user of Thrive and I definitely agree with what you’ve said in this post. Awesome Paras Shah. I just now started using Thrive Ovation and hope you too love it. Good to see so many good plugins, and bloggingio uses some of it. Hope you too love it. Thanks for your great review. Hope you love their products? May I know which products are you using? This one is a perfect list, and I agreed with all of your points. I’m also a huge fan of Thrive Themes and Plugins. They are superb in terms of providing great WordPress products. Thanks a million for this excellent article. Happy to see your comments her and I started following your blog recently and its great. Hey, Mohan. A must read I’ve read so far for Thrive products. Right now I’m using Eleven 40 Genesis Theme, but in future, I’ll use Thrive for sure. Thanks a ton for this informative post. 🙂 Stay Blessed! Yes. Once you start using Thrive Themes, you stick with them for life. This is my second visit to your blog, and I’m also in love with your blog. You have shared a lot of useful content here. I’m very pleased to know that you are also following my blog. Heartly Thanks, Buddy! I have read a post by Mr. Sherman about TCB with these lines. “It’s better to have it and not need it than to need it and not have it”. Bit confusing. However, a good saying. Analogous to that, TCB stands. I am glad to be on this page as I have got enough information on Thrive Products. We don’t want to have ‘n’ number of plug-ins while choosing TCB, undoubtedly. Thrive Leads, Ultimatum, Thrive Architect and so on, you have elaborated to the extent. The better option for building a landing page. Hi, I found your blog very helpful keep sharing!